One finds good news where one can these days, and here comes some good news for the church: the work of ecumenism thrives in the field of theological aesthetics. Granted, we’ve had to float into a rarefied atmosphere to recover this news, but what’s going at the intersection of theology and the arts does promise hopeful, on-the-ground implications. This report is based on one of the many books published this year to commemorate the 500th anniversary of the Reformation—so many books it’s as if publishers are celebrating the occasion by tossing a confetti of printed pages into the world. This particular volume, The Ecumenism of Beauty(Paraclete), accompanies a series of symposium events organized by the Community of Jesus, “an ecumenical Christian community in the Benedictine tradition” in Orleans, Massachusetts, along with its Mount Tabor Ecumenical Center for Art and Spirituality is Barga, Italy. The Ecumenism of Beauty, edited by Timothy Verdon, reads much like an art exhibit book, with essays by a diverse assembly of authors, all of whom are connected with the symposium. Some of the essays offer short, scholarly reflections; others read like artist’s statements. The most appealing feature of the book—and the reason for its steep $28.99 retail price—are the couple dozen color plates illustrating the text with photographs of worship spaces, religious art, and pieces designed specifically to enhance the prayers of the people in houses of worship. 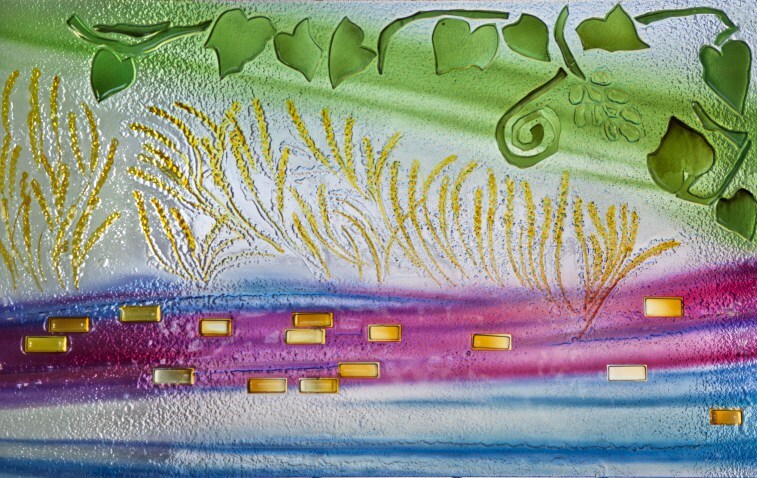 The authors intend to celebrate the way in which visual art, especially visual art designed for worship spaces, can unite Christians across traditions. Immediately, however, we have to account for the ways in which visual art has divided us, and indeed a couple of the essays attempt to reckon with the history of antipathy to visual arts in Protestantism, reviewing, nuancing, and correcting common notions. Jérôme Cottin’s essay on Calvin’s aesthetics, for instance, claims Rembrandt, Van Gogh, and Mondrian as Calvinist artists. William Dyrness reviews the history of worship spaces, considering why Protestant spaces became so severely plain. He calls Protestants, after 500 years, to lean away from that tradition of plainness and toward a recovery of the Christian artistic tradition and a renewal of visual beauty in the worship space. Shannon follows up with his own succinct summary: “Beauty leaves its witness with an appetite for more.” This theme—that the experience of beauty draws us toward God—resonates throughout this little book. My heart sings when I read such words. Yes, I have experienced this. Haven’t we all? The experience of beauty renders us supple to the working of the Spirit, longing for God and open to God’s overtures toward us. Then enters the skeptic. 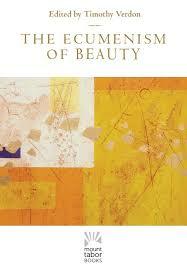 I wondered: why the simple use of “beauty” as the singular quality of good liturgical art? The term lingers undefined and uninterrogated. “Beauty,” in its immediate and intuitive connotations, does not account for the full range of art’s qualities or effects. Couldn’t something ugly also serve to provoke our prayers in a liturgical context? Aren’t some depictions of Christ on the cross, for example, appropriately ugly? Art can melt, transport, silence, lead us to wonder and praise, but it can also provoke and challenge. I wanted more consideration of that possibility in a worship context. Moreover, The Ecumenism of Beauty limits its scope to visual art in the church. Fair enough. But I often thought, as I read, about the need for more reflection—ideally ecumenical reflection—on music and words in the church. While the more severe Reformers insisted on scouring churches of images, the Protestant tradition nevertheless cultivated luxuriant blooms of hymnody, poetry, other literature, and music. “While Roman Catholics, Lutherans, and Anglicans have been foremost in the dialogue between theology and the arts, now scholars of the Reformed tradition increasingly engage with questions including the role of the visual image in places of worship, distancing themselves from some of the Calvinist iconoclast polemics of the past. This field of theology is per se ecumenical, i.e. without having consciously set out to achieve such aims. One would suggest that this can only be of benefit to theology, ecumenical relations and the wider search for Christian unity.” (Theological Aesthetics: A Reader, Eerdmans, 2004). Let the theological aestheticians lead the way to unity! Meanwhile, what might be those on-the-ground implications of theological reflections on aesthetics? If we’re lucky, renewed and renovated worship spaces—worship spaces fully and intentionally designed to awaken our expectations of divine encounter through structure, textures, materials, windows, objects. And on the way toward that goal, the celebration of artists and an honoring of their gifts. 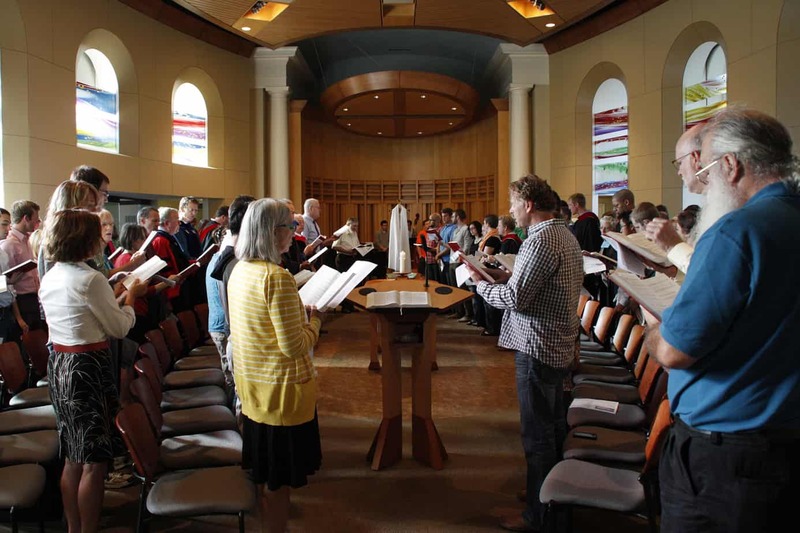 As a case in point for this hopeful possibility, I leave you with the images at the top of this post and right here, from Western Theological Seminary chapel’s 2012 renovation. The art glass windows were designed by Sarah Hall and the renovation was designed and implemented by Elevate Studio. You can see more here.